Found at Albertsons of all places by a coworker, who bought two more. 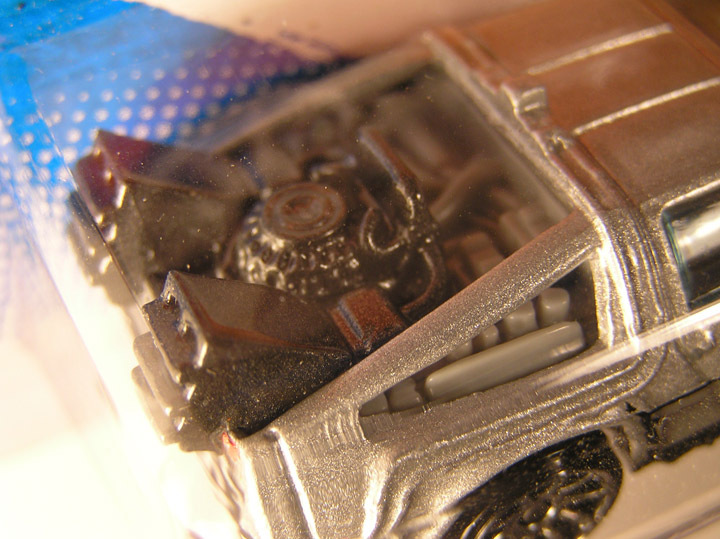 Its a pretty awesome miniature car to have, and will race well in its package vs the Ecto 1. 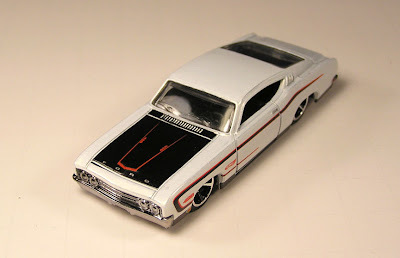 I am a little disappointed that it is low on detail/paint features, but who's to complain about a dollar car? I hope they make the next two movie versions, and the train of course. 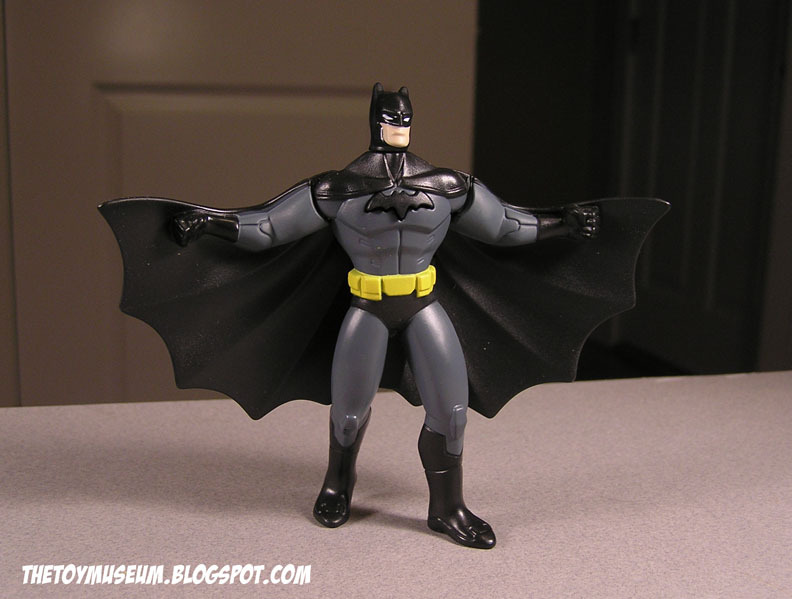 I seem to have more Batmen then I thought, as I keep remembering places that I store toys. Poor Justice Lord Batman has been in package for so long, his cape has plastic dust decay. Besides the decay, he is a really nice figure. Now I need to remember where I placed my Batman/Joker mini cereal figures; where the heck did those go? With a purchase of a few cool Batmen today on Ebay, I just might crack 50 Batmen by the end of next week! Disney Tailspin DVDs, and a Baloo F bomb during Pirate battle? Here we go on another Tail Spin. I picked up season one last week on a great deal at Costco. $8.99 for a full season. I used to love this show. Nothing better than adventurous plane rides. I had a great time watching these classic episodes, until on episode 4 I caught something that didn't sound right. I let my friend Thatboywhite, borrow and listen too, and he recorded it. Note that when the subtitles are on, there is clearly three words said, not just too. What did he really say??? Still a great classic show. I guess the joke on Captain Cold's figure is that he successfully froze himself in a dorky stupid position. Most of the other Young Justice toys are at least nice stand alone figures, but Captain just looks silly. Is he trying to listen to his freeze gun? Is he using his head instead of shoulder for a brace? 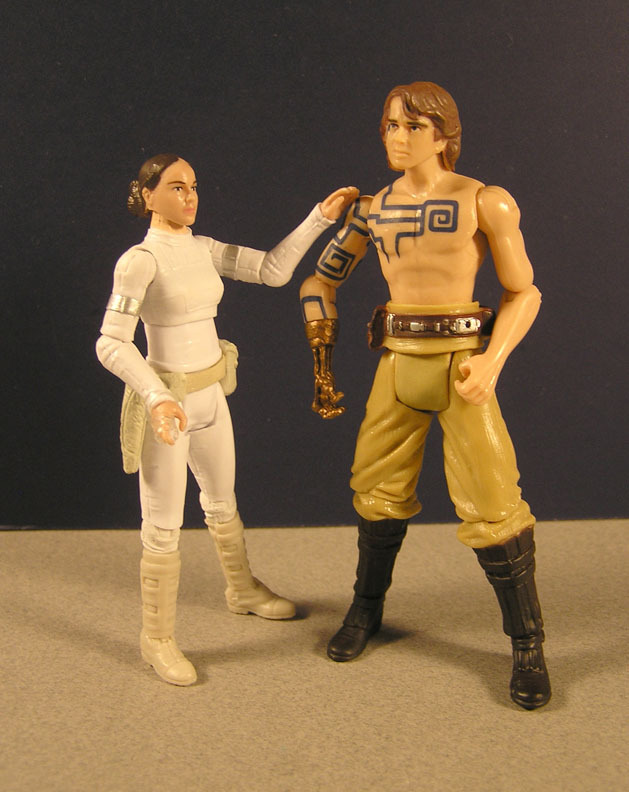 Of course, I secretly wanted him the most because of that dorky look. Superman and Superboy turned out pretty good. Superman's arm punch out, with a push of a back button. 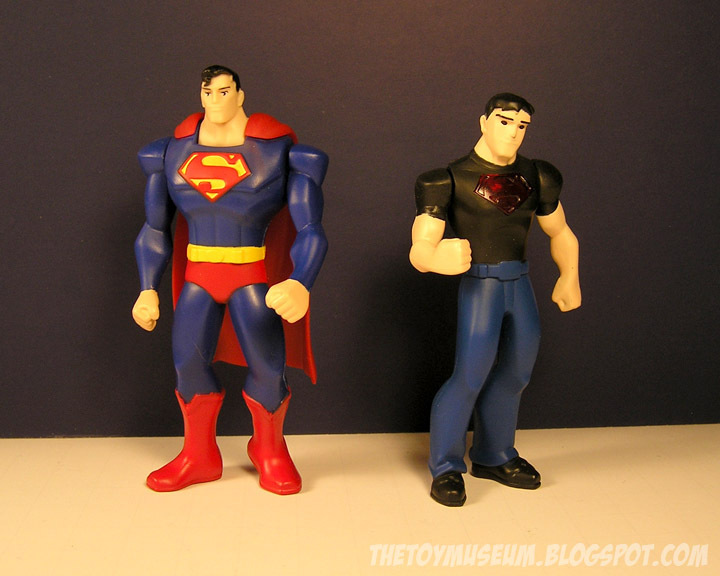 Superboy's eyes and chest lights up red. So for Superboys look, is that the Superman we will see for years to come, jeans and a logo tee shirt? 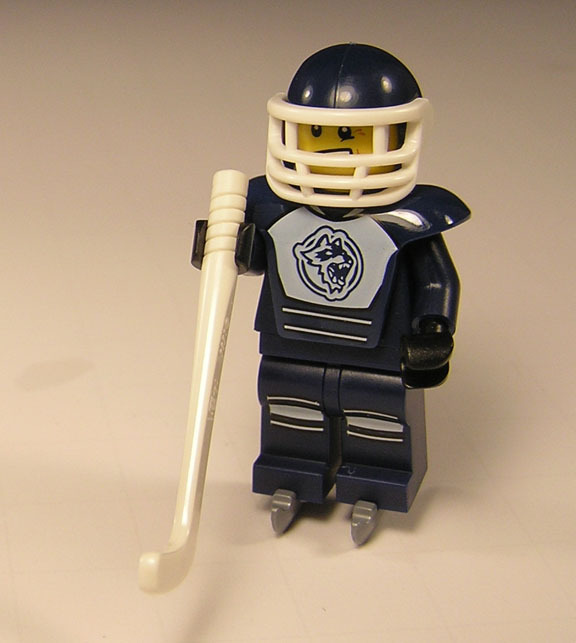 At least he could have a retractable cape. I have been debating about re-grow-a-fy-ing my neglected Batman collection for a few months now. 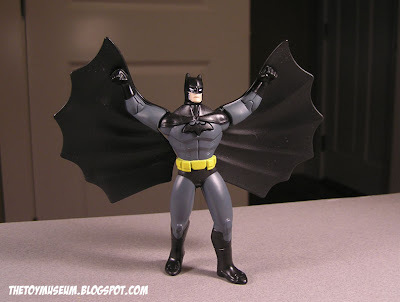 At one time, I am sure I was close to about 80 Batman toys. I sold many, as I didn't need so many bright neon one projectile shooting Batman Returns/Animated versions. Now a days I see so many kinds and variations, I feel I need to fill in some of the voids again. 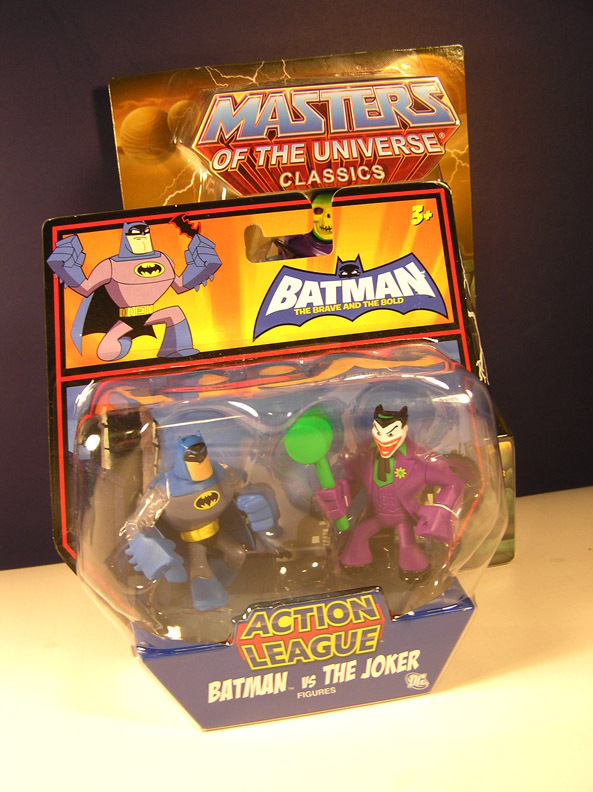 This set of Action Leaguers is neat, as it also has a Joker (I have a nice Joker collection too). These two don't have too much motion but they are cute, I mean Manly, additions to the shelves. 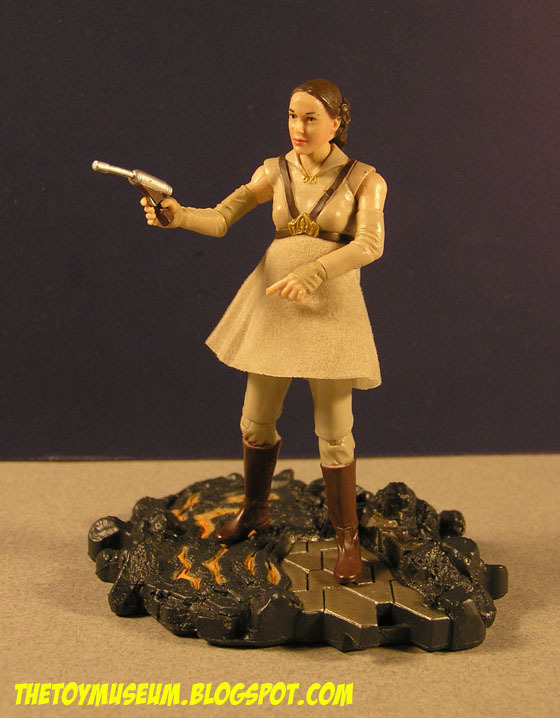 Now I need to find full size Brave and Bold versions. Gad, what year is this?!! Sometimes when you have a blog that runs over five years, you have no idea what you have posted about in the past. 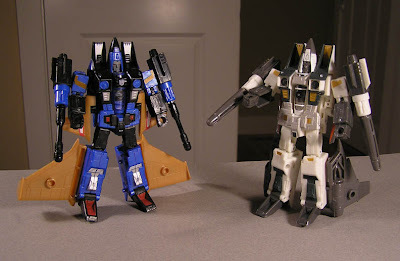 Did I show these guys before? Bah, I need an intern. So besides that, here are my favorite mini cons, Team Space! 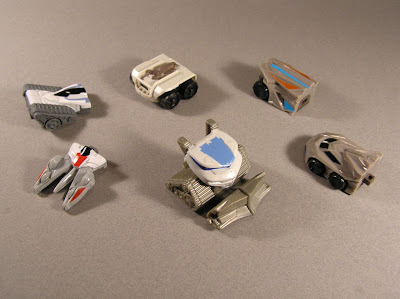 I mainly bought them to circle Uranus Unicron's rings. They seam most appropriate, space ship/satellite themed. From right to left, Payload the payload truck (with backwards legs, darn it) , Sky Blast the Spaceship, and Astroscrope the rip-off of Babylon 5. I love how mission maxed they are. You can really push the boundaries of imagination with these kids! Astroscope has some great legs too by the way. They also form a gnarly ray gun, that can be assembled in a variety of ways depending on what kind of space Energon your smoking. And there's Payload with the proper leg rotation, I can finally sleep at night. My Sister sent me this update on the code for the Haz Mat Guy. Hope it helps. 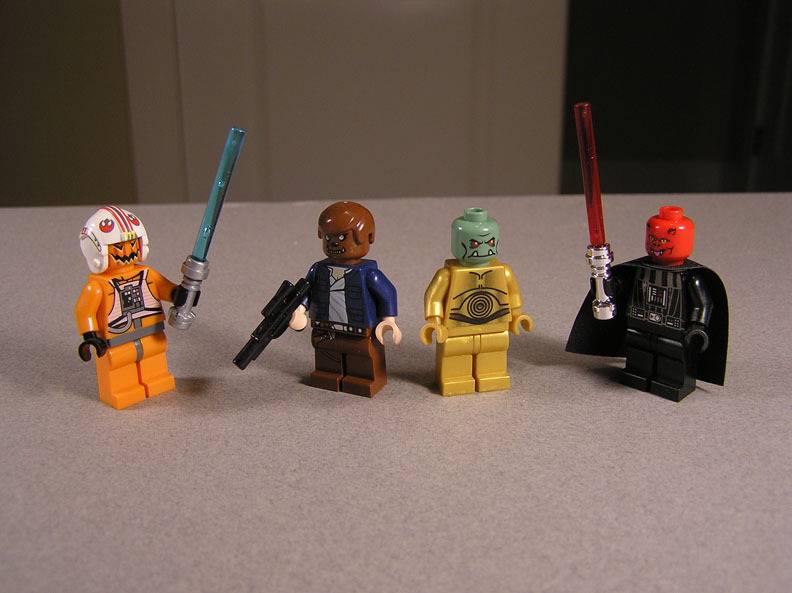 I got a heads up call from my awesome sister who spotted the new series 4 Lego minifigures in the Easter aisle. By the time I got there (2 hours later) they were gone! But a few new orange cases remained behind the old series 3 green cases in the regular toy aisle and I pounced. I picked up six packs, using the amazingly stupid eye hurting bump pattern on the back. 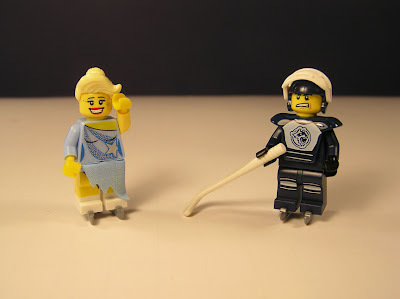 The first two I opened, just happened to be coincidentally the ice skaters! I just realized now, the spare black peg piece, is the puck! The down side to the ice skaters is if you want them on their stands you have to take their skates off. 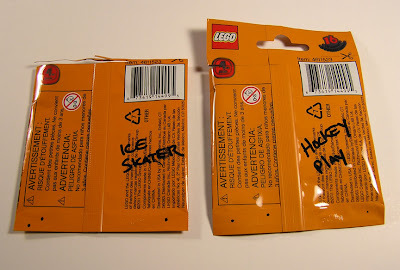 But I guess you can store the skates on their butts. 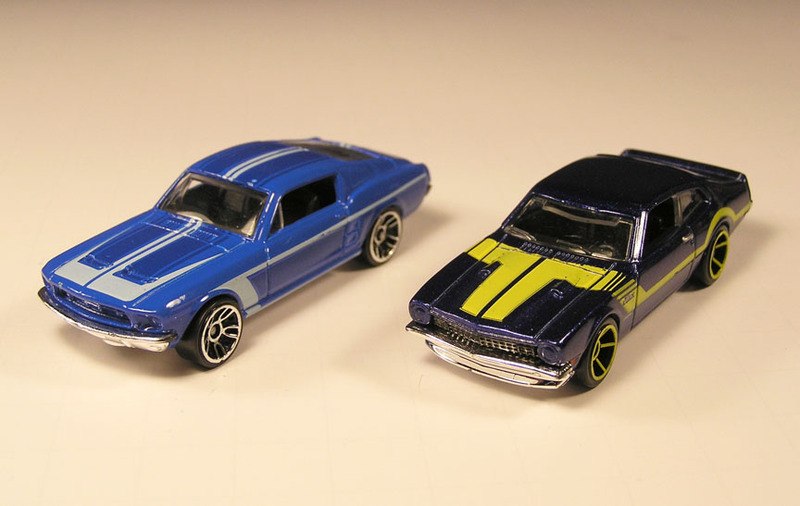 The Hot Wheels muscle cars this year are so colorful, I keep picking them up! The two blue above are favorites. Its fun to get five of these racing at the same time on the old track. The candy cane striped '65 Mustang Fastback is a favorite for speed and control. The Green number 4 Javelin also speeds well, but flies off often. 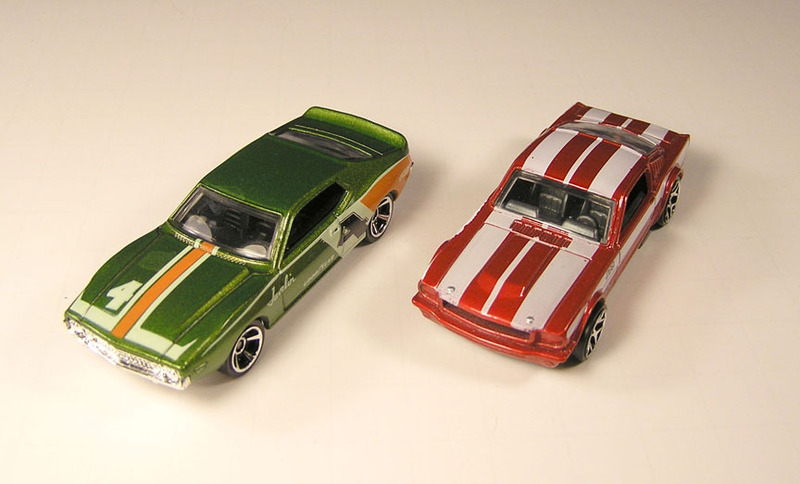 The '69 Ford Torino, is not so good on the track. 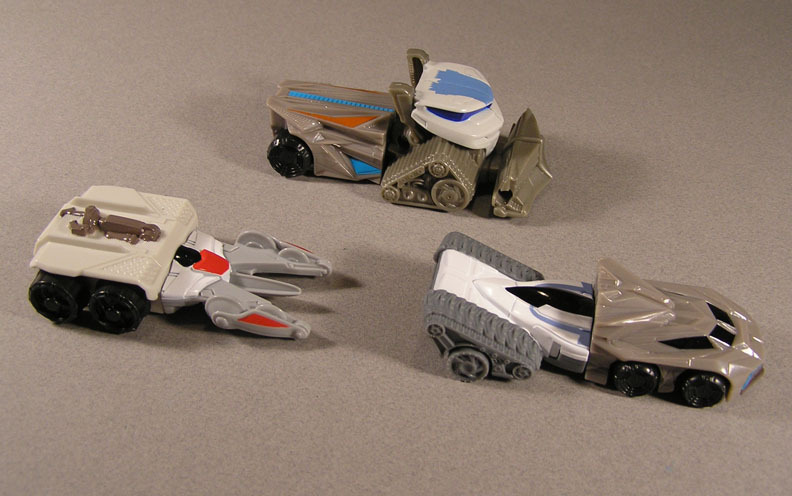 Must be the narrow wheels, and low wheel wells. Padme Amidala AKA Natalie Portman, Pregnant Star Wars Action figure, and who's the father? 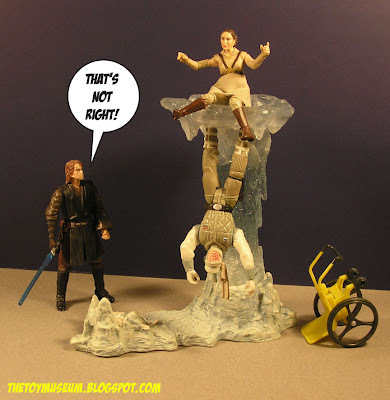 I guess if your are one of THOSE kids, you could reenact certain things, and with the shirtless Anakin Action figure, its much easier. Just look how she admires his snail ink tattoo. 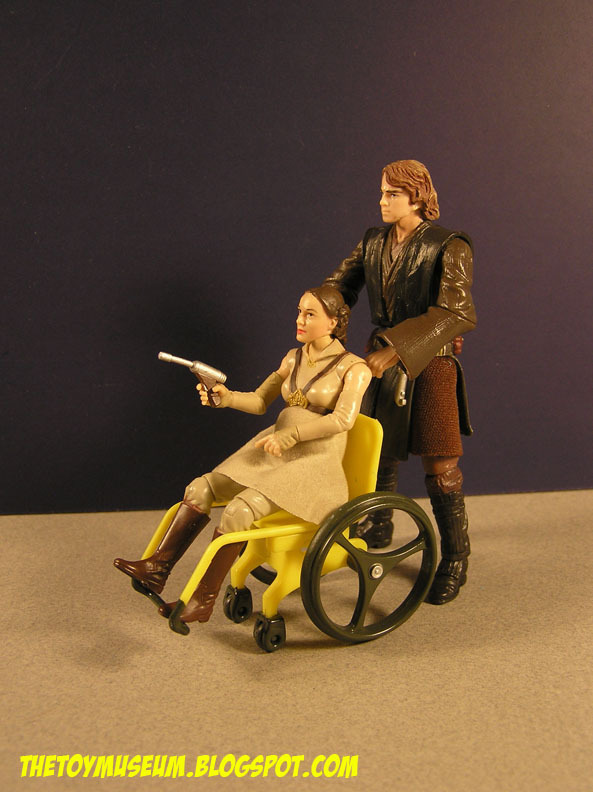 But after those events, there is not much left to play except Star Wars General Hospital. 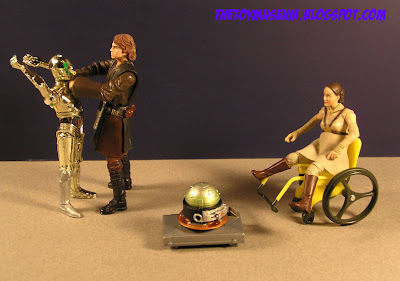 A small protocol droid, could mean C3P-0. 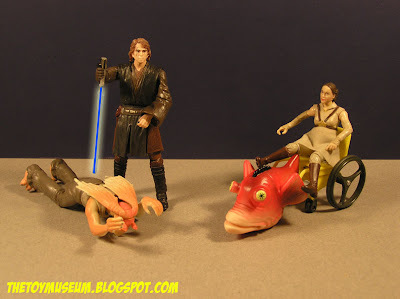 Jar Jar wouldn't last long after this shocker. 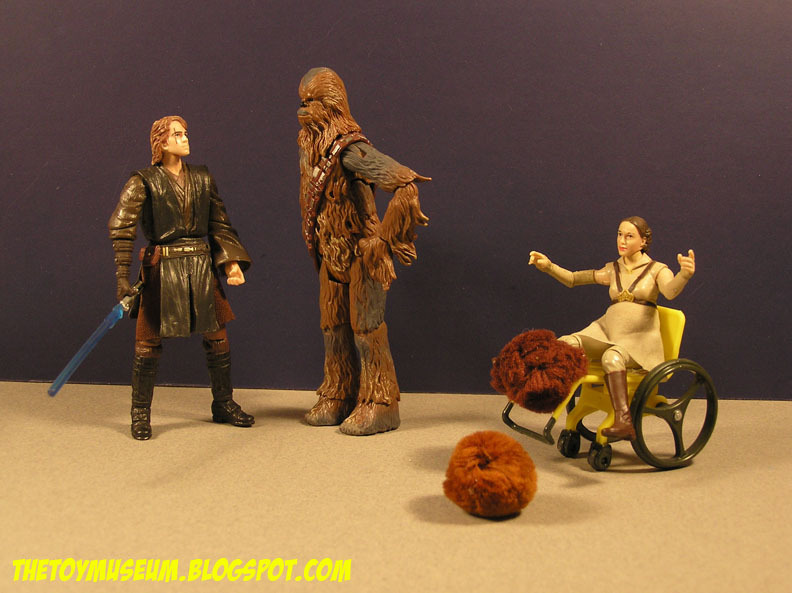 At the very least, Chewbacca was able to pull off twins. I guess I came down on these too hard, the Bat-man is really cool for a stand alone toy. 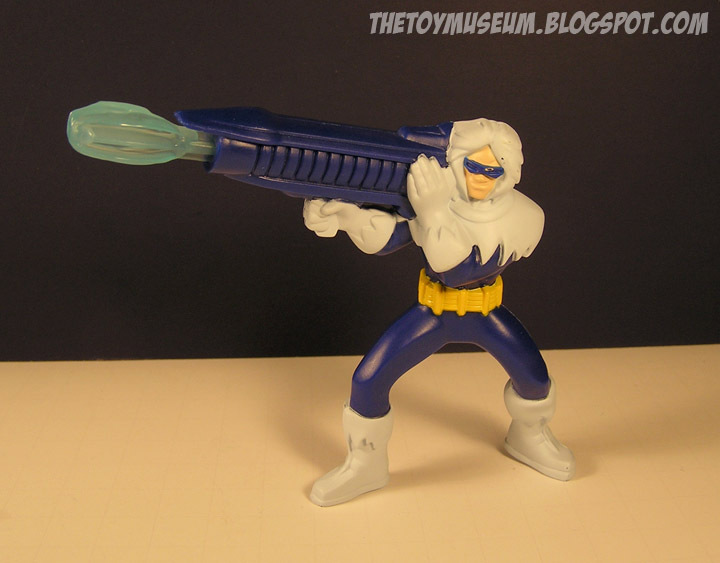 At least he isn't frozen in a dorky pose with one projectile (Captain Cold anyone?). Bats here flips his arms and cape out high (and for some reason, I would think it should go the other way). 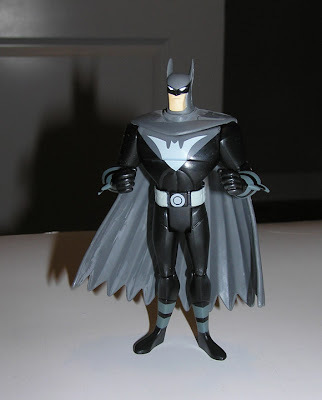 I will add him to my Batman shelf that has been absent of fresh additions for awhile. 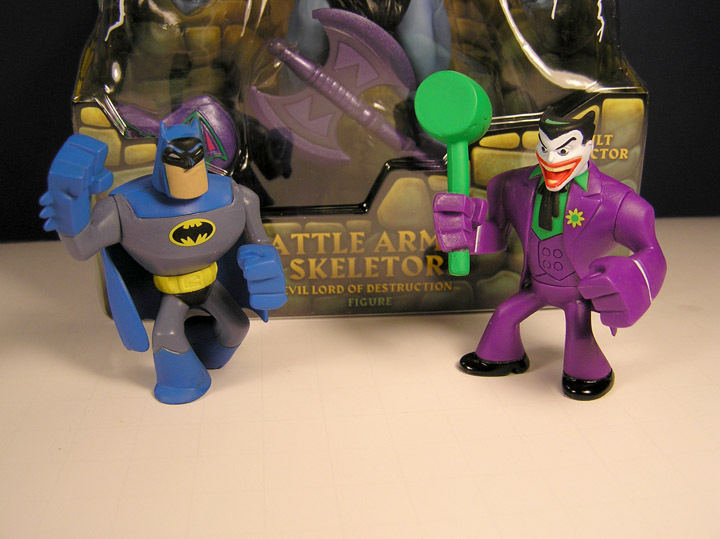 Batman and Robin are not a bad set. As for the rest of the Justice Young, I will get more only if I am needing the nourishment of another Happy Meal in the next couple of weeks. 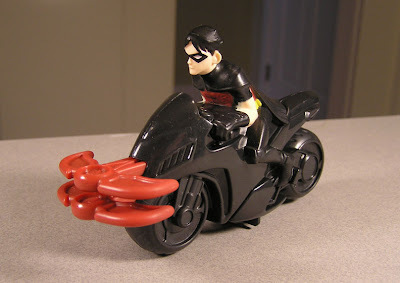 Hot Wheels are already out the door, and now its on to Young Justice toys for the Happy Meal. I got to say that most of these are not so good. 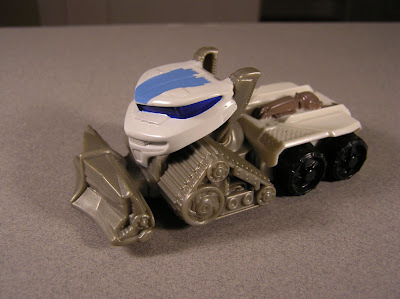 It's easy to pull off cars and trucks, but toys based off comic characters not so. I wish McDonald's could standardize a figure design so that every time a show like this came around, they could stick with a common line. 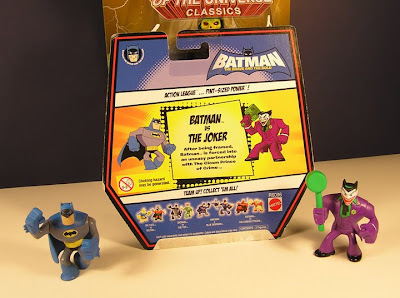 You would think it would be cheaper, but I guess they probably bid on stuff like this years in advance, with probably thousands of rejected stuff. Remember that awesome Marvel Capsule Machine I spotted a few months back? And remember I got those awesome Marvel Capsule toys like Spiderman, Hulk and Thor? 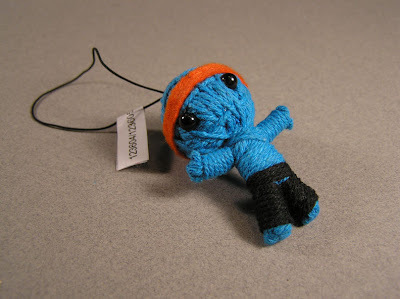 Well, when I had saved another four quarters and went for another one the other day, this is what was in its place... Creepy Sring Dolls! I was surprised they switched out the Marvel capsules, there was still quite a bit left earlier, I guess that's way. So now I have to collect these creepy little String Dolls. 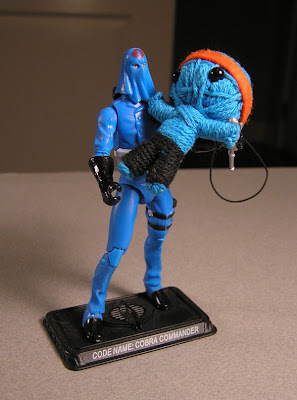 Naturally, Cobra Commander has taken it under his wing, filling its head with propaganda. Someday I will fall down the stairs and this guy with get shoved up my nose. 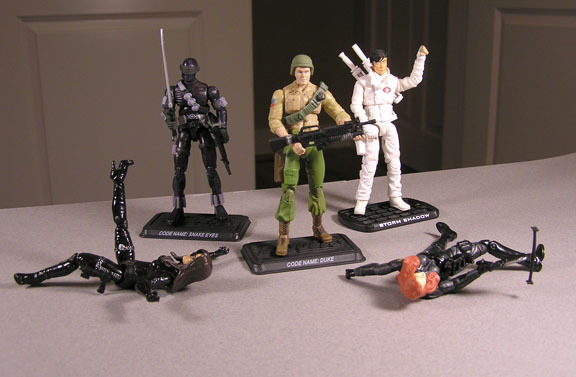 WHAT the heck is happening with the next GI Joe movie?!? 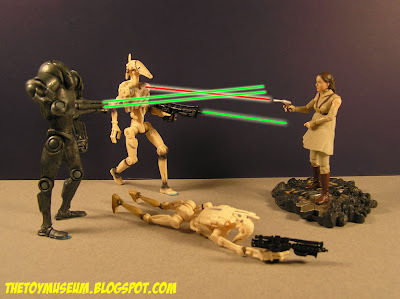 Hasbro?!? I am so confused with what is coming out for early news on the next GI Joe movie. I don't know where to start, everything is so conflicting! Good News: There is a sequel! Even though I blindly loved the last movie, its hard to believe they will be able to continue on that story line. If its really a mess, please wait a couple years and reboot. 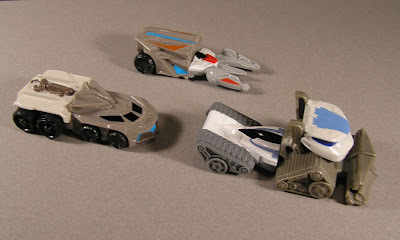 Next summer 2012 release? Serious, it will be buried by so much competition. Hasbro, please hire me as a consultant!!! Good/Bad News: New Director! Some guy, Jon Chu, who did the 'Step it Up' movie sequels. I don't really think this is good or bad. I have seen many directors shine when they finally get their chance, and many great directors tank when they get their last, so I think this will be good? Good News: Zombieland writers! That movie rocked, I hope they continue the wave. Bad News: Sienna Miller out as Baroness (and maybe Rachel Nichols, as Scarlett). I can understand Sienna, it wasn't her gig, she can be replaced. BUT Scarlett, uh this is a GI joe movie right? So, if they start replacing everyone, or start omitting key characters, PLEASE just re-start the darn franchise over. So yeah, a mess of feelings. At this point, I sadly see this not ending well, and me being very sad. How is it that the new Cartoons, and comics are done so well, and the movie situation not. Who at Hasbro is running this thing into a wall??? I hope when more news comes available, it will calm my uneasiness. I had a clearance opportunity to finally try out a Lego Game! I have been meaning to buy one of these for months, but something always came first. 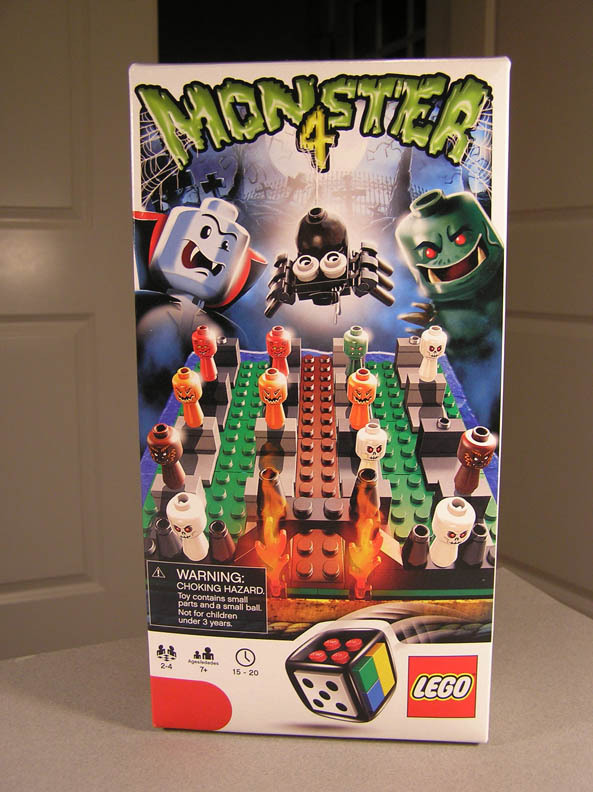 Not this time, the Monster 4 Game was half off. The Game Board is pretty unique, being a creepy cemetery with headstones as your markers. Monster 4, is a smaller sized game for 2 to 4 players, meant for about 15-20 minute play time. Your goal is to fill a line of monsters much like Tic-Tac-Toe, by roll of dice, with a few obstacles on the way. 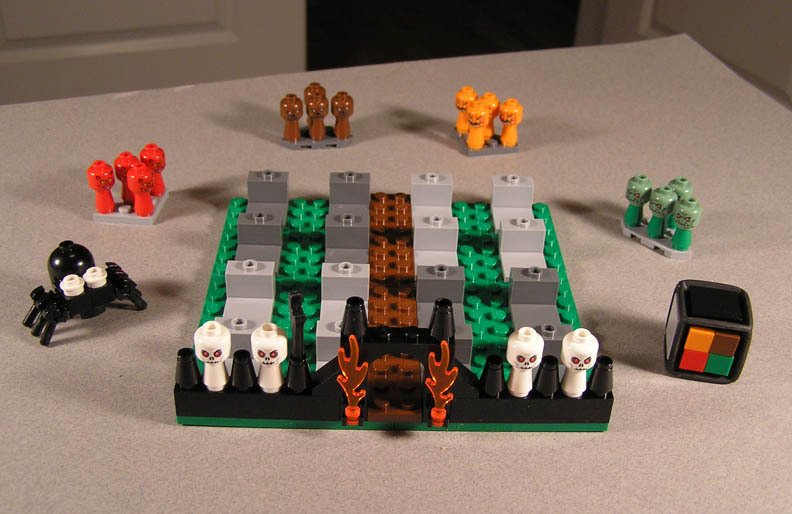 The Spider will reset a four block area, and the white skulls are wild cards. Its pretty fun idea for a short game. When we played, it took some time to get things going, but then all of a sudden the dice determined a clear winner. 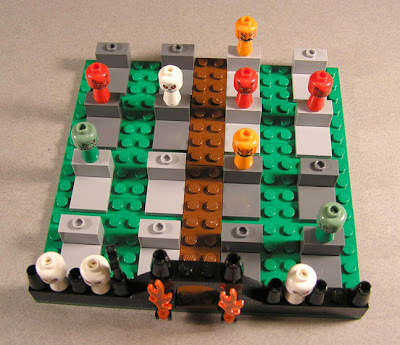 I can see several kinds of game plays happening, with some light strategy here and there. 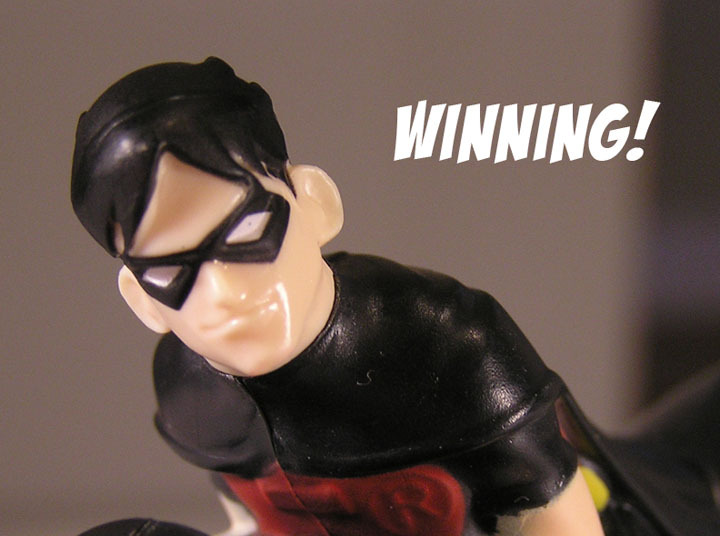 The picture below shows the winner is red. Its either a hangover effect from last months Tonka trucks, or there is something addicting in the Happy Meal food, now I'm finding these Hot Wheels Battle Force 5 toys terrific! I'll do my best to stop with these three, but darn, my itch/twitch for them is really bad. 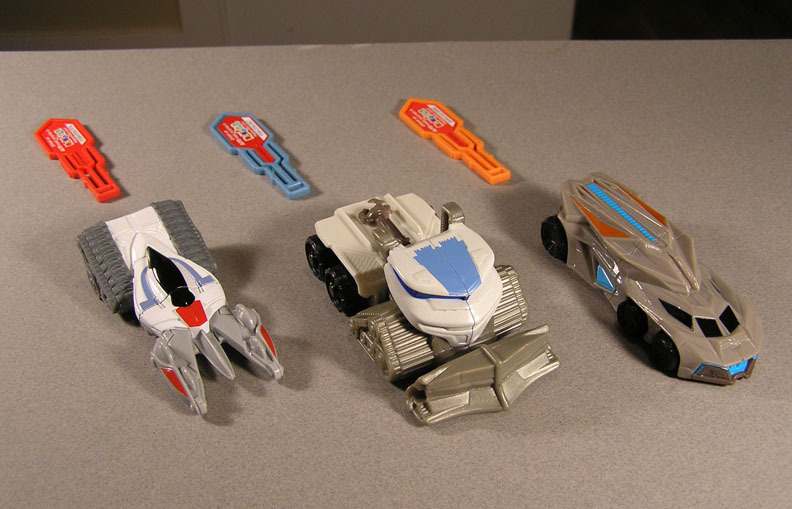 Pretty simple, they comprise of two pieces that form a car that launches a few feet, with a key inserted in the rear, then squished. The Rigsaw, or what I like to call Earwig, has a sharp look to it. 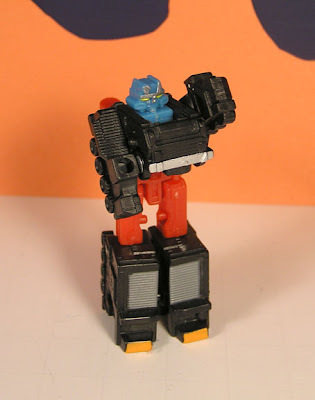 While the Gearslammer reminds me of an Animated Optimus Prime. Maybe if I watched the show, I would know more. You can mix and match the car halves for many combinations. Here they are all broken apart, oh-no! I like Combining the Front of the Gearslammer with the back of Rigsaw, for a double treaded beast. 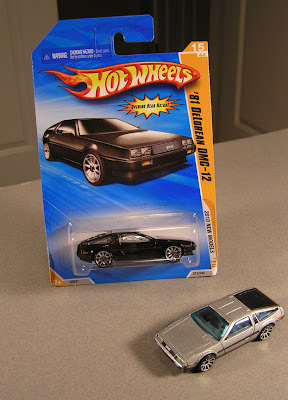 Its hard not to pick one of these up in every color, thank you Hot Wheels. Looking for the gold one too. A spiffy Yahoo Autos Article/Forbes today appeared on the DeLorean cars comeback. 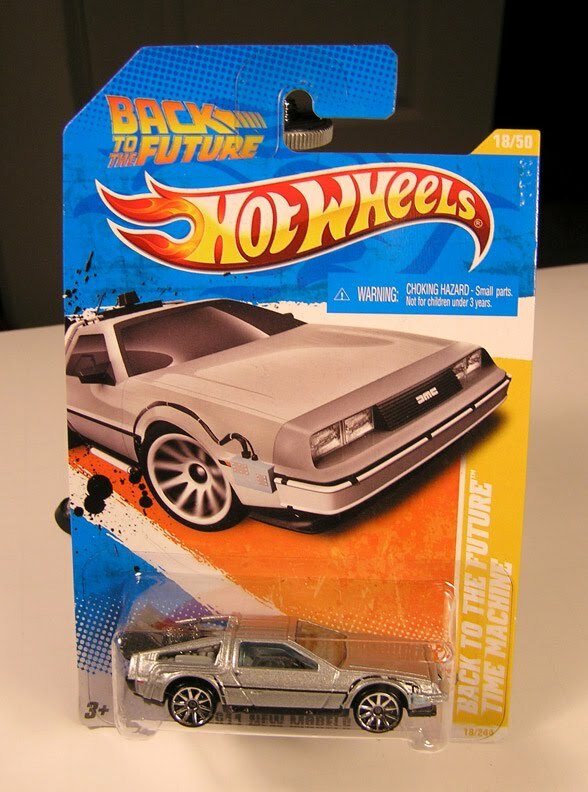 Also a few notes at the bottom on the Hot Wheels toys, and yeah, a Back to the Future version soon! 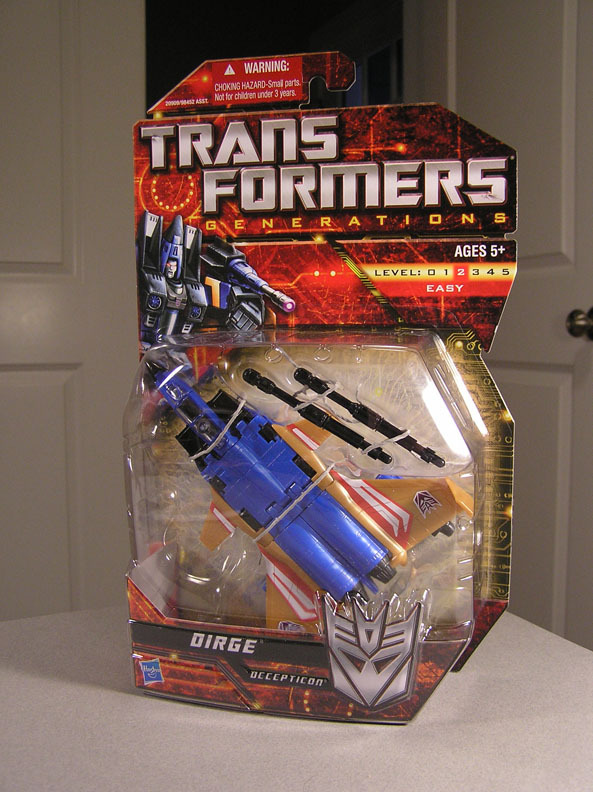 Dirge is the Decepticon that has the brown or orange wings, which almost look like wood paneling. 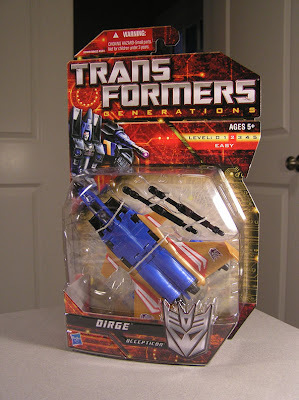 Dirge is part of the cone head Decepticon team from season 2. 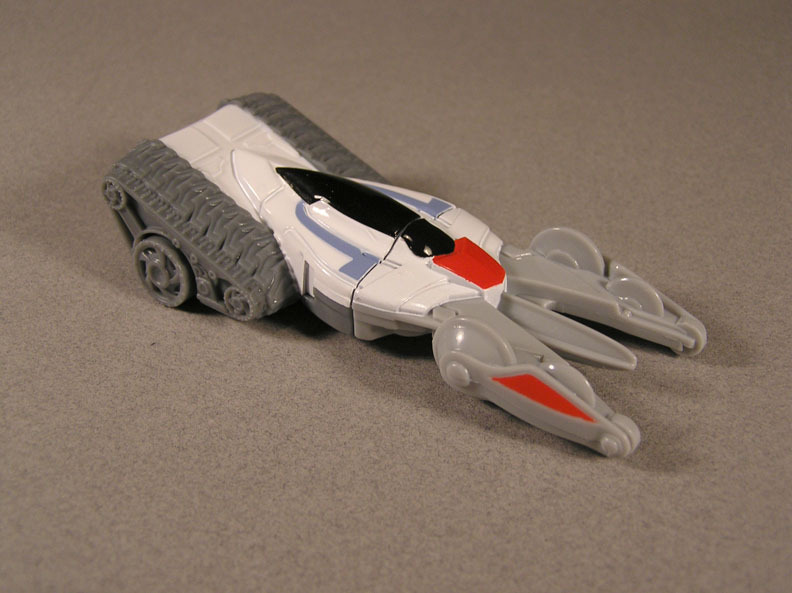 Its nice for Ramjet to finally have someone to bounce joke ideas off of now. You can see the slight differences in their wings. 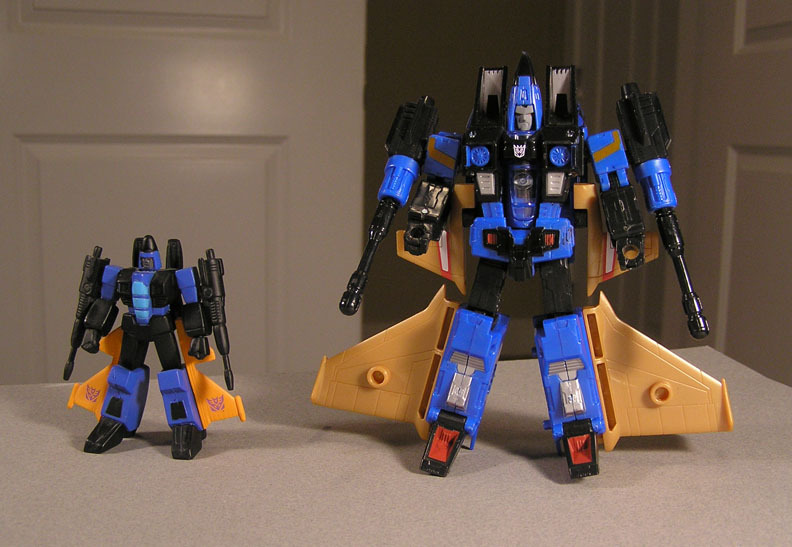 Dirge's tail fins, are on the end of his wings, while Ramjet has more ramjets. 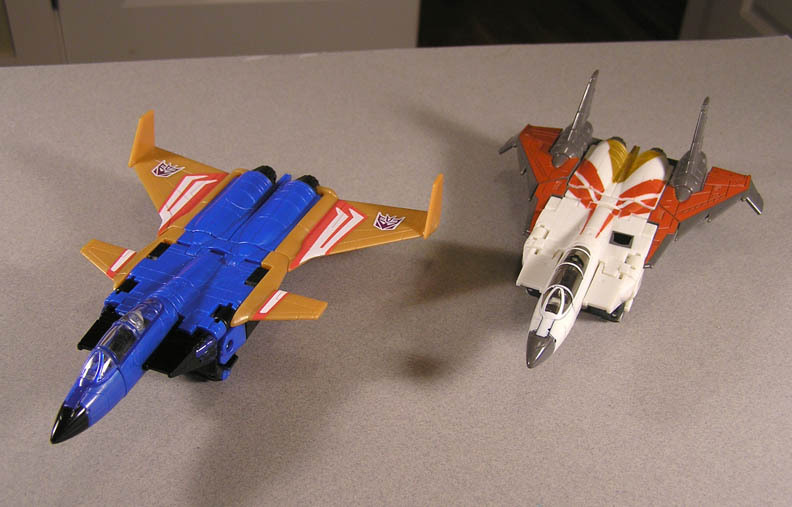 I would pick Dirge up if your're collecting all the jets, or have never played with the new classics jets yet. They are a sintch to transform, and are great to have as a get-a-way plane, if you rob banks.